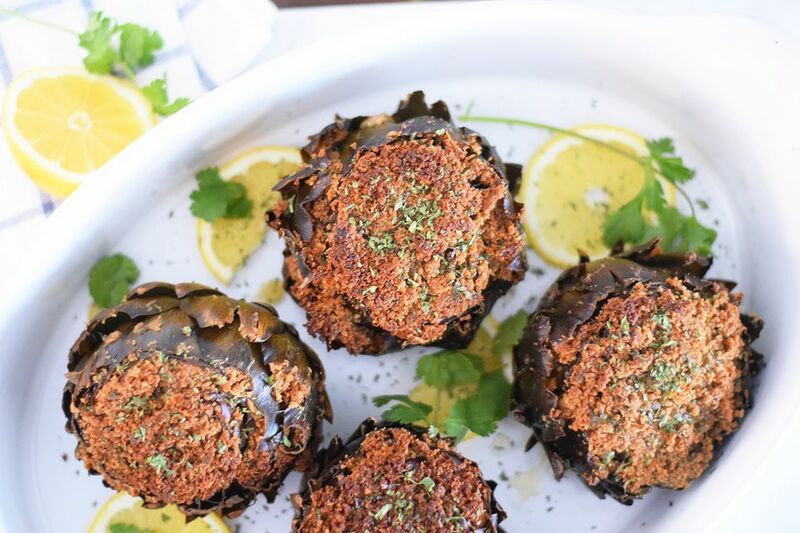 Whether you are an expert artichoke cook, or you haven't tried your hand at making them before, we've got a scrumptious recipe here that will get you enticed to start making these babies for your next meal. They are delicious, impressive, and are much less complex to make than they might appear. They are the perfect appetizer for dinner guests or for a simple Sunday dinner at home. Whatever the occasion, we are sure you will enjoy these Italian-stuffed artichokes! Since this recipe is so simple, each ingredient is super important. But don't let that deter you. Just make sure to use fresh garlic, quality butter, extra virgin olive oil, and either fresh or fine dried parsley. Pick out artichokes that have tightly packed leaves and make sure the leaves are nicely intact. The whole wheat breadcrumbs add a nice body and roundness of flavor, but you can also substitute with regular seasoned breadcrumbs. While they take over an hour to bake, they are quick and simple to assemble. Get them in the oven before you start preparing the rest of dinner, and you'll be golden! Rinse the artichokes well under lukewarm water. Trim the top off of the artichokes, as well as any other spiny ends that aren't taken off. Then trim off the stem so that the artichokes will sit flat in the baking dish. Gently pull the leaves apart to make room for the stuffing. In a medium-sized bowl add the melted butter, breadcrumbs, dried parsley, and lemon juice. If you have a microplane grater, use it to grate the garlic into the bowl. If you don't have one, finely mince the garlic or use a garlic press. Add the parmesan cheese and stir the ingredients to combine. Add the salt and pepper to taste. It is ok if the stuffing is a little on the saltier side as the artichokes need quite a bit of seasoning. Add the artichokes to a casserole dish, then stuff each artichoke with 1/4 of the stuffing. Pack it in between as many layers of the artichoke as you can. Add the lemon slices to the casserole dish and fill up with about 1/2-inch of water, then cover with aluminum foil. Place the covered casserole dish on a center rack in the oven and bake for 60 to 80 minutes, depending on the size of the artichokes. To test doneness, use a sharp knife to pierce the bottom of the artichoke. It is cooked if the knife pierces very easily. Carefully remove the artichokes form the baking dish with two large spoons. Sprinkle them with more parmesan cheese, parsley, or a squeeze of lemon juice if you wish, and enjoy!